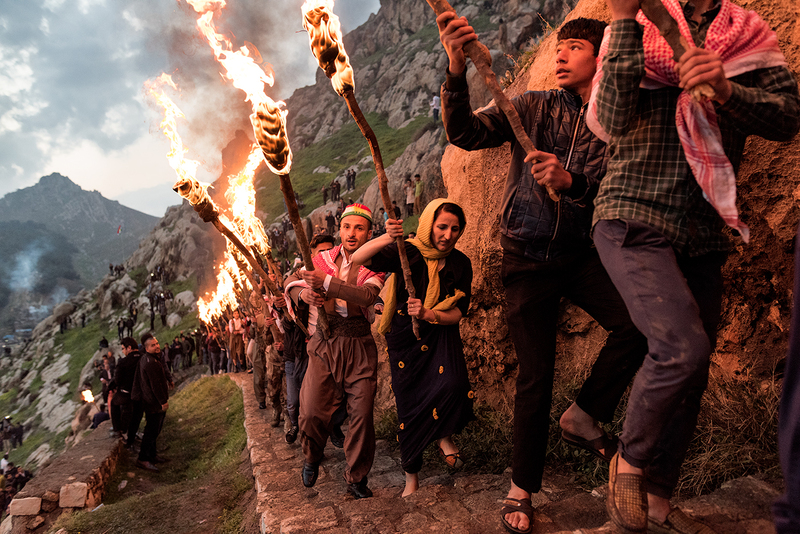 The ancient fire ceremony of Newroz marking the rite of Spring and the Kurdish New Year in the mountain city of Akre in northern Iraq. A procession of torchbearers is led to the highest peak overlooking the city. Fireworks and gunfire echo about in a celebration that has had special meaning since the fall of Saddam Hussein. Previous to the American occupation in 2003, these people lived under the threat of indiscriminate slaughter and genocide. Now for the first time in centuries, they hold the beginnings of their own nation and the possibility of self-determination. While still considered a province of Iraq, Kurdistan is the proud homeland of a people that have lived dangerously as outsiders for most of their history.